About 30 miles north of Milwaukee is the town of Waubeka, Wisconsin. In 1885, a schoolteacher placed a small flag on his desk and asked his students to write about what the flag meant to them. Flag Day was born, and every June 14th, we celebrate. 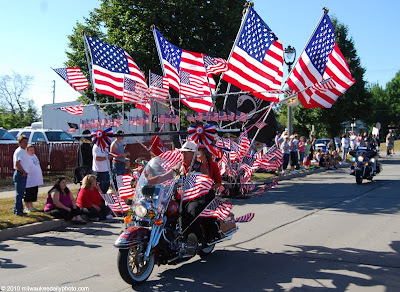 Today's photo was taken at the 2008 Harley parade. I saw this collection of flags and knew it would come in handy for a day like today!